Without a doubt, Rolex’s biggest hit of the year is the new GMT-Master II “Pepsi.” Built in stainless steel and flaunting the iconic red and blue bezel, the GMT-Master II ref. 126710BLRO is one of the most coveted luxury sports watches right now. This is a similar story to the 2013 release of the GMT-Master II “Batman,” which is still an immensely popular modern Rolex watch. Let’s take a look at both GMT-Master II models side by side to see how they compare in terms of design, mechanics, and desirability. First, let’s go over the shared design details of the GMT-Master II ref. 126710BLRO and the GMT-Master II ref. 116710BLNR. Both these GMT-Master II in stainless steel features a 40mm Oyster cases, have Cerachrom ceramic bezels, and include black “Maxi” style dials. Furthermore, they include sapphire crystals protecting the face of the watches with the essential Cyclops magnification lens sitting on top of the date window at 3 o’clock. They are both fitted with Triplock screw-down winding crowns, which play an integral part in the GMT-Master II’s 100-meter water resistance. On the other hand, there are some notable design differences between the GMT-Master II Pepsi and the GMT-Master II Batman. Clearly, the biggest one is the color of the bezels. The GMT-Master II 126710BLRO sports a blue and red bezel, echoing the colorway of the very first GMT-Master watch from 1955. The combination of blue and red is an iconic one the GMT-Master’s history and Rolex has used it on several models throughout the last six decades. The GMT-Master II ref. 116710BLNR features a black and blue bezel and the “Batman” is the first and only Rolex watch to use this color combo on a bezel. In fact, the GMT-Master II ref. 116710BLNR was the first Rolex watch to feature a bi-colored Cerachrom bezel. Rolex had previously announced that creating a two-tone bezel in ceramic would be impossible given the material’s structure. However, Rolex did eventually manage to merge two distinct colors on one Cerahcrom bezel and it was the GMT-Master II ref. 116710BLNR that kick-started that. It’s important to remember that the duo of colors on any GMT-Master bezel is not just for looks but it also offers a way for the wearer to quickly differentiate between daylight and nighttime hours in a second time zone. Another major design variance between the GMT-Master II ref. 126710BLRO and the GMT-Master II ref. 116710BLNR is the bracelet style. While the GMT-Master II Batman comes exclusively with an Oyster bracelet, the new steel GMT-Master II Pepsi is only offered with a Jubilee bracelet. Some are unhappy with Rolex’s bracelet choice for the GMT-Master II ref. 126710BLRO since the three-link Oyster bracelet is the sportier choice compared to the dressier five-link Jubilee. 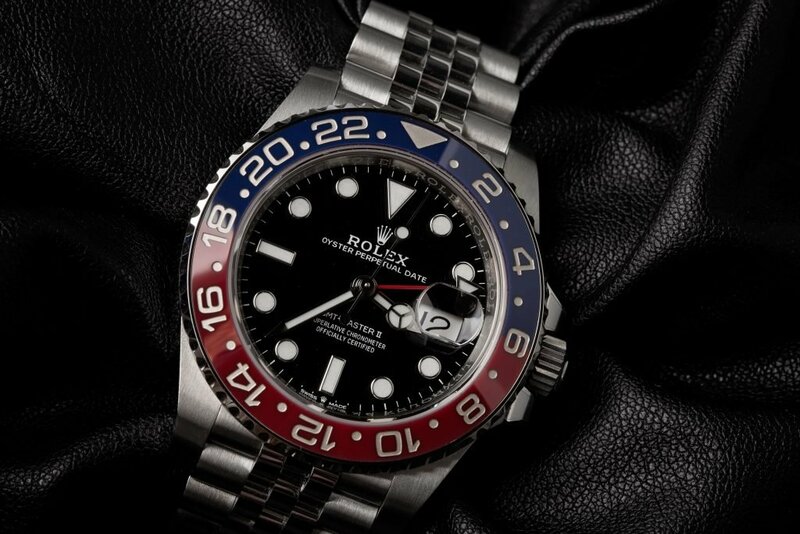 Yet, Rolex probably made this decision to distinguish between the white gold GMT-Master II Pepsi and the new steel GMT-Master II Pepsi. Despite the difference in bracelet styles, both the GMT-Master II ref. 126710BLRO and the GMT-Master II ref. 116710BLNR include the folding Oysterlock safety clasp with the Easylink 5mm extension system. As most of you know, the Rolex GMT-Master watch was born to service airline pilots by allowing them to track multiple time zones. Modern GMT-Master II watches permit wearers to keep track of three time zones thanks to the ability of the 24-hour hand to be set independently from the center hour hand. Local time zone is displayed via the center hour and minute hands. A second time zone is then indicated by setting the 24-hour hand to point to a specific hour on the bezel. And finally, a third time zone can be shown when the bezel is turned in either direction. A big change between the new GMT-Master II Pepsi and the GMT-Master II Batman lies within the case. The GMT-Master II ref. 116710BLNR runs on the Rolex Caliber 3186 with approximately 48 hours of power reserve. Conversely, for the new GMT-Master II 126710BLRO, Rolex uses the new-generation Caliber 3285 with an amped up 70-hour power reserve. 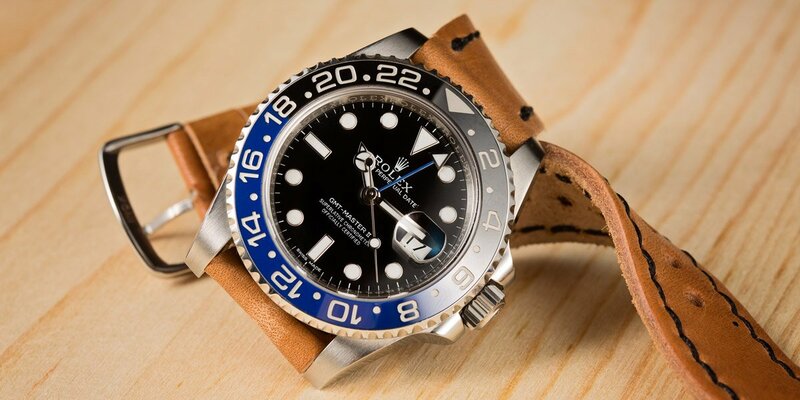 Rolex GMT-Master II 126710BLRO or Rolex GMT-Master II 116710BLNR? Both fantastic looking modern Rolex sports watches that offer practical GMT functionality, it’s tough to choose between the GMT-Master II 126710BLRO and the GMT-Master II 116710BLNR. Although the GMT-Master II Pepsi is the newer model with an improved movement, it really comes down to a matter of your taste in colors and bracelet styles. Will it be red, blue, and Jubilee? Or will it be black, blue, and Oyster? Which is your favorite GMT-Master II between the Batman and the new Pepsi?